Sean also performed 'One Man Can Change The World'. 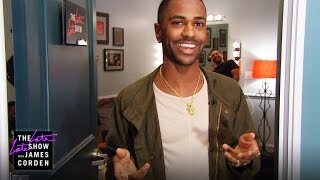 Following his 10 nominations at the BET Hip-Hop awards, Big Sean stopped by 'The Late Late Show' with James Corden and performed a hilarious parody of his hit single ‘IDFWU’. “I don’t wanna talk,” rapped Sean over the track, as he refused to leave his dressing room. “You little musical guest,” added Corden. “I got a million trillion things I’d rather do, than to be talking to you,” responded Big Sean. The rapper also performed his hit single ‘One Man Can Change The World’, which recently won him an award the VMAs.